Ashley Nicole's Dream Playground | KaBOOM! No one likes to feel excluded. But after being paralyzed at the age of four from a car accident, Ashley Nicole didn't enjoy her local playgrounds anymore. She couldn't access the swings and slides to join in the fun with other kids. A friend of the family, Ashley Ogle, read about a universally accessible playground in Nashville called Lily's Garden and decided Knoxville, Tennessee could just as easily build a playspace like that! Ogle soon realized just how much Knoxville needed a universally accessible playspace. She and the volunteer committee who joined in her cause believe in the power of inclusion. If even one child in Knoxville couldn't fully access a playground, that was reason enough to move forward. To determine the extent of the need, however, Ashley and her team studied the numbers. They were astounded to discover nearly one in five children in Knoxville have a disability. With 50,000 schoolchildren in Knoxville, there were perhaps 10,000 children needing an accessible place to play! A team of dedicated volunteers has made Ashley Nicole's Dream Playground a reality. Once you start, Ashley commented, you almost cannot give up because people are counting on you. Knowing they wanted to include a sensory-rich garden area, the playground team was delighted when nearby Sertoma Center called offering to design and maintain a garden at the playground. As an organization that helps adults with developmental disabilities find and keep jobs, the Sertoma Center was an ideal partner for the playground. The garden area Sertoma Center created is coming along beautifully and was recently nominated for the Keep Knoxville Beautiful Orchid Award. Ogle is now an expert fundraiser but initially, she and her team weren't well-connected, so to speak. Reflecting on her experience, she would have waited to publicly call for donations until she had collected a portion already. It often seemed, she recalled, like people only wanted to give if you already had some money. She would have also included someone on her committee with fundraising experience. Ultimately, publicity was their key to raising money. Ogle credits Don Barksdale as the secret weapon that made Ashley Nicole's Dream Playground a reality. Don moved the project forward with his experience as a communications consultant. When he approached her team, they were $280,000 short of their $290,000 goal! Don successfully convinced dozens of donors to believe in Ashley Nicole's Dream Playground. Five years from the day Ashley Ogle first gathered volunteers, on June 29th, 2005, Ashley Nicole's Dream Playground broke ground. The playground is 11,000 square feet in size and fully accessible to children with a variety of disabilities. 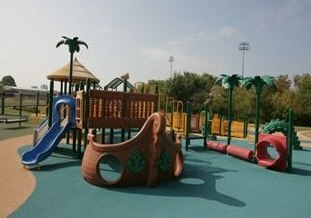 The playground uses poured-in-place surfacing, ramps, and transfer stations so that children of all abilities can play together. Sensory play is a part of the fun, with a Sway Fun Glider and a texture-rich garden. 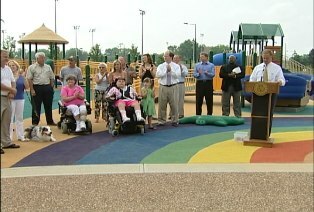 In 2005, the Tennessee Recreation and Parks Association named Ashley Nicole's Dream Playground the Best New Facility in 2005. But best of all, Ashley Nicole has fun at the playground again! Ashley Ogle has these words of advice for people planning accessible playspaces: "Do it. Keep doing it. We started in 2000 and we are still adding to it. Persistence is the key."